So you say you love a good cat eye, and there is really no way to get exactly what you want without using a liquid liner. Well, we have a great one for you! 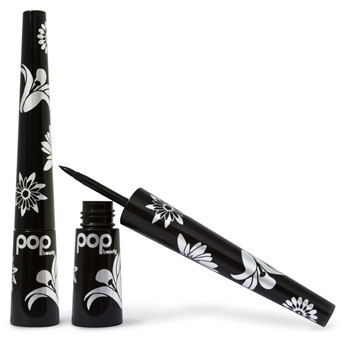 Pop Beauty, a company out of the UK started by Sara Strand, has one of the best ones we’ve ever used. My One Liner is all you need. I’ve tried a zillion liquid liners. (I’ll be reviewing some great glitter liners in the days to come.) But for a great traditional cat eye, I’m currently in love with Pop Beauty’s My One Liner. The reason this one is a favorite for me on set is that the line is elastic. It doesn’t flake and it doesn’t smudge. Nothing is worse than having to stop a shoot because the hot lights have dried out the gorgeous black line on an actress’ eye and it’s starting to flake down her face. I’ve used this one on a shoot in the desert! No flaking at all. It’s also pretty water resistant. I wore it out dancing…and I mean dancing! I’m not going to say there was anything else left on my face, but my liner outlasted my dancing feet. Pair this one with their Lash Wow mascara (great comb for separating lashes) and you’ll have a flake-free night. Pro tip: Dot your line in light gray pencil first and connect the dots with the liquid liner. That way you won’t have to keep darkening the line while trying to make them even. Yeah, even the experts have done that. Pop Beauty My One Liner is available at Ulta.com and retails for $18.